Happy Wednesday … wait, Thursday, right? I’m very ready for this week to be over. It’s been one of those weeks where I feel like I’ve just been running and running at work and home while not much seems to be going right. This morning I was all dressed for work and stepped right into a fresh pile of cat barf strategically located in the hallway outside our bedroom. After spending 10 minutes scrubbing my shoe, I decided I wouldn’t be able to get it all cleaned in time and had to find a different pair. Then while backing out of the garage this morning, I was treated to a gawd awful, high-pitched squealing coming from my engine … the new belt that I had put in Sunday. My curse of never getting good auto service lives on apparently and I had to run it back to the shop today to get it tightened. It’s weeks like this I have to keep reminding myself that I’m very blessed and how silly I am for making a big deal out of little annoyances. While I escaped work for about an hour to drop my car off, I decided today called for extra caffeine and stopped by a nearby Starbucks for a vegan vanilla frappuccino. It’s been a long time since I’ve had a frappuccino, maybe over a year? That’s an occasional splurge for me and I paid for it by just buzzing from the caffeine until lunch. I also picked up a new travel mug for hubby that has a little compartment to store a couple of VIA instant coffee packs – perfect for a caffeine pickup during his insanely busy work days. 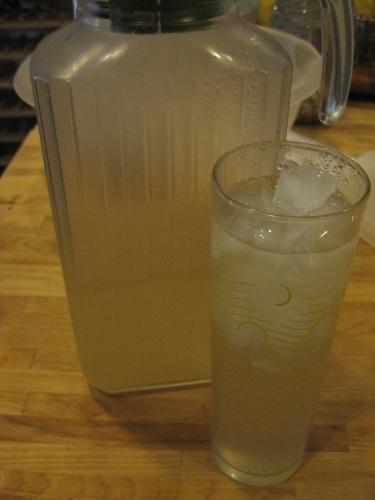 A chilled glass of homemade kefir water. Since I started making it a couple of weeks ago, my water kefir grains have gotten considerably stronger making the brew more like a sparkling cocktail and not so sweet. Over time the grains will get stronger and multiply, my mom is already looking forward to me unloading my extra active grains on her. It’s been a bit of a hassle producing a new 4-cup batch of kefir water every 2 days, but it’s also been nice having it ready in the fridge always. I’ve been sipping on 1 – 2 glasses a day and I think it has been helping my digestion and appetite. Plus the active grains can be stored in the fridge in sugar water for up to a week for vacations, etc. I’ve been feeling more tired this week, but still pushing my half-marathon training and exercise schedule which may or may not be a great idea. With the longer running distances I’ve been pushing, my ankles and legs are getting more sore and tired. I got a couple of pairs of running compression socks to try during and after runs for better recovery and will be trying more ankle strengthening exercises. But would love to hear input from more experienced runners, wink wink. 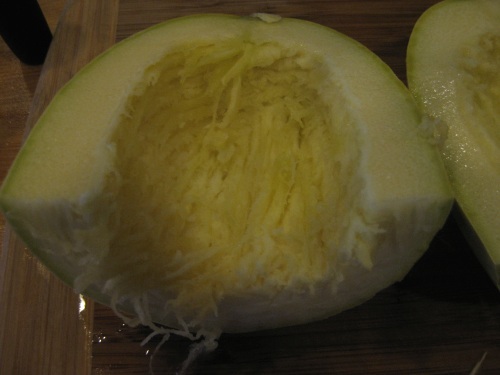 Anyway, thanks to my dad, I am loaded with spaghetti squash. Good thing because it’s one of my favorite foods even though I have not found a great way to eat it raw yet. It’s low in calories, like 40 per cup, a good vitamin source, and just fun to eat with a pasta/noodle texture. I spent a bit of time getting creative with it for dinner decompressing from a stressful day last night. I started with a pretty big squash. 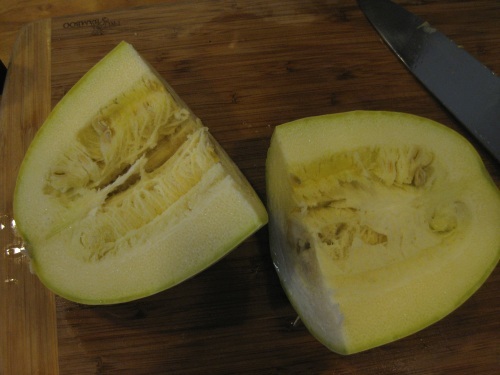 Cut into quarters and scooped the seedy guts out with a fork. Then I ghetto-steam it by turning the quarters upside on a shallow layer of water and microwaved for 8 – 10 minutes. 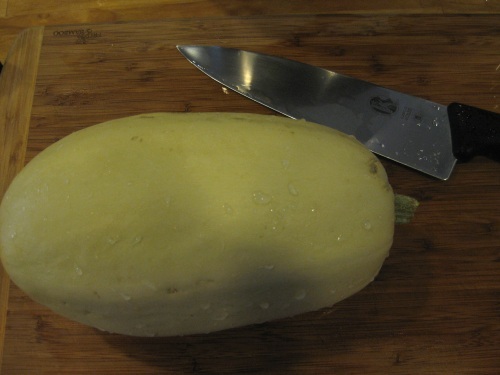 That makes the squash soft enough to scoop out like pasta and serve. 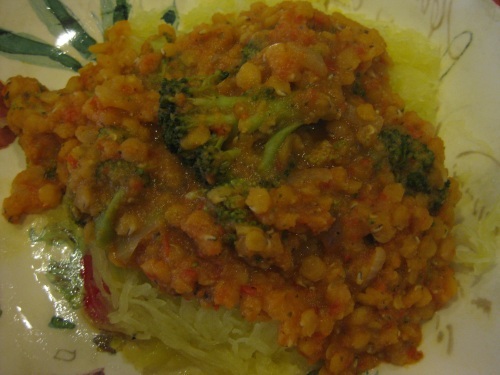 For this dish I simmered red lentils in a homemade marinara sauce and broccoli to serve on top of the squash and it turned out to be a great healthy dinner to throw together quickly. Dry lentils only take 15-20 minutes to cook stove top, during which I threw together the marinara sauce in the Vita-Mix, steamed the squash and chopped the broccoli. Then I simmered the sauce and broccoli with the lentils for another 10 minutes and it was ready to serve. And I have plenty of leftovers for tonight’s dinner – not raw, but a healthy, whole-food vegan meal packed with veggies and protein. 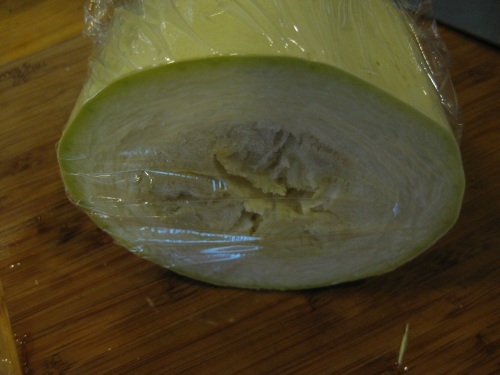 Cut spaghetti squash also stores nicely in the fridge for a few days when you can’t eat the whole thing, I just cover it in plastic. 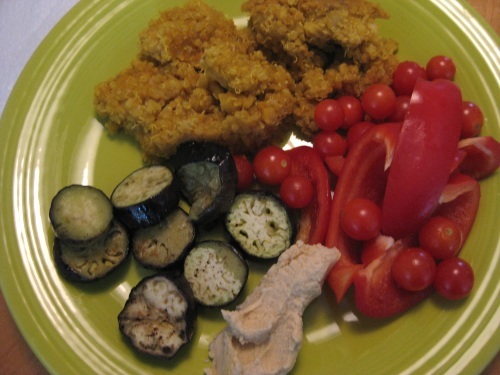 Curry lentil quinoa, sauteed eggplant, hummus with red pepper slices and cherry tomatoes. Kind of an uncreative mesh of leftovers for lunch that worked. 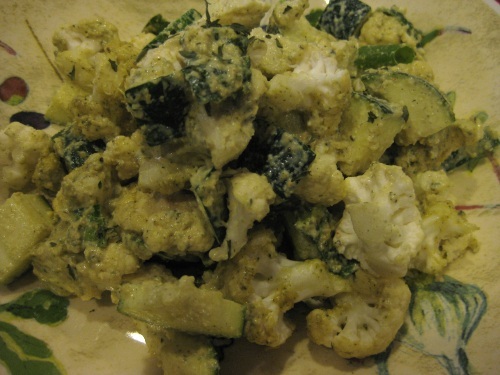 A variation of creamy cauliflower with added kale and zucchini for a quick, simple and filling dinner after a busy day. What’s nice about this dish is I can create it ahead of time and place in the Excalibur to warm while waiting for hubby to get home from work. It was also good as leftovers with lunch the next day. 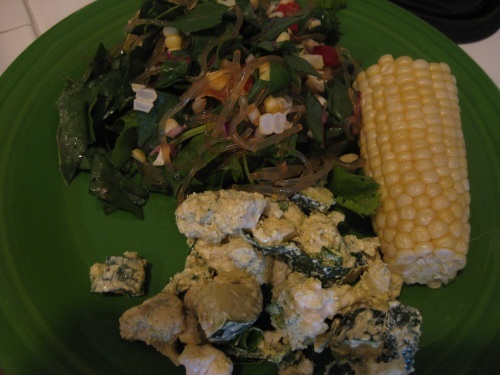 Along with a salad including marinated kelp noodles and corn, another crazy mesh of leftovers for lunch. The salad had chopped raw chard from my garden in it and it was awful, way too bitter. Chard is another veggie that I have not been able to enjoy raw yet and need to try massaging it with a little oil next to tone down the bitterness. just want to say hi, glad you enjoyed the frapp. we all need that sometimes! your food looks great, as usual..
and the kefir, so glad you’re a kefir making machine! running late, sorry for short comment! Love the ‘ghetto steaming’ method! lol! U are so funny! Hey it gets the job done, thats all that matters! Sorry about your car, car troubles are the worst and stressful! I see you have been enjoying your kefir water, I do miss kombucha!!!!!!!!!!!!!!! The cat barf…OHHHH no! I’ve done that before, but with dog poop. Such a nice surprise, right? 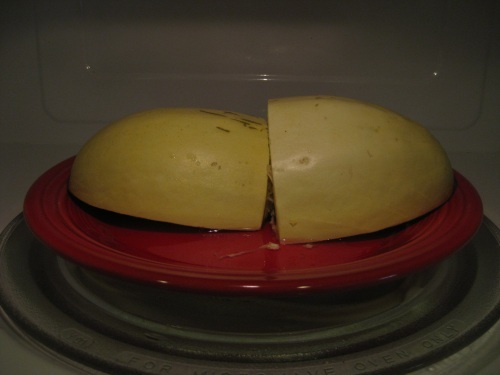 I love spaghetti squash – which is sort of funny since I don’t like regular spaghetti :) Yours looks yummy!